CHARLOTTE – Defensive backs wish Panthers wide receiver Ted Ginn still had something weighing on him. Maybe that would help slow down one of the fastest players in the NFL. "When I came to Carolina I had a burden on me," Ginn said. "I just wanted to get it off." The burden? A stigma that was firmly stuck to Ginn's reputation; a stigma that he was nothing more than a return man. "I knew I could play punt return and kickoff return," said Ginn, whose 6, 978 combined kick return yards rank fourth in the NFL since 2007. "But I always wanted to be more involved in the offense." The burden has been lifted, and Ginn looks as explosive as ever in his seventh season. It started in the preseason finale against Pittsburgh, when Ginn burst onto the scene with 35- and 87-yard touchdown receptions. The week prior, he displayed his trademark return skills, returning a punt 74 yards for a touchdown against the Ravens. He finished the preseason with nine catches for 214 yards, and the question quickly became could he continue that success in the games that counted? Through three regular season games, Ginn has seven catches for 143 yards and two touchdowns – the first, a 40-yard score against Buffalo, the second, a 47-yarder against the Giants. Those two touchdowns match a career-high for Ginn. The ninth overall pick in the 2007 NFL Draft by the Dolphins moved on to San Francisco after three years in Miami. He recorded one touchdown catch in the next three years with the 49ers. In 2012, he had two catches for one yard. "I would say so," head coach Ron Rivera said. "From what we're gathering and what he's done for us, to me, he does look like he was underutilized." Now, Ginn is one of four players with multiple scrimmage touchdowns of 40 or more yards. The others are Giants wide receiver Victor Cruz, Saints tight end Jimmy Graham and Vikings running back Adrian Peterson. "I think Ted has already kind of shattered the stigma of just being a special teams player," quarterback Cam Newton said. "He gives this offense an added dimension that keeps the defensive backs on their heels. You have to respect his speed." 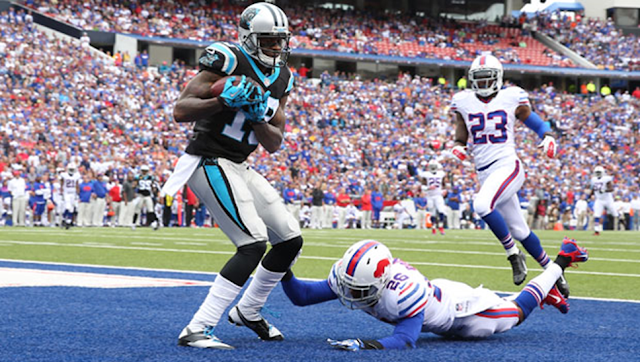 That speed is a weapon he used to get behind the defense on his two long touchdowns, and that's exactly what Rivera and general manager Dave Gettleman envisioned when they signed Ginn as an unrestricted free agent this offseason. "Dave and I sat and talked about what the vision was for Ted, and that was a guy that could blow the top off the coverage," Rivera explained. Said Ginn: "That was something they told me I was going to have a shot at. I took their word for it." He's used his speed to great effect thus far, blowing past defenders on deep patterns. That was the expectation, and now that Ginn has put that production on tape, the Panthers are realizing just how extensive Ginn's effect on a defense can be. "With Ted, we found out it wasn't just line him up and go," Rivera said. "You watch Ted, he puts his head down and corners are bailing. Pretty soon, the next thing is going to be the stops. He'll put his head down like he's going, and then at 20 yards he'll stick his foot in the ground, turn around and come back. Those are the things that are starting to happen, and Teddy sees it." "They're scared," added wide receivers coach Ricky Proehl. "When Ted comes in, defenders are thinking he's going deep. He creates such a cushion, so now we can throw him comebacks, we can throw him curl routes." The threat of the deep ball has opened up more opportunities for Ginn. It's also created more opportunities for his teammates. When Ginn enters the game, there is suddenly a lot more room for fellow-wide receivers Steve Smith and Brandon LaFell to work underneath. "What he's done is open things up for us. When you have that speed, it sets other things up," Proehl said. "It takes so much pressure off of Steve and Brandon when Ted comes in and has that immediate impact." Ginn understands his role, and he's flourishing in it. "I take the top off the defense. 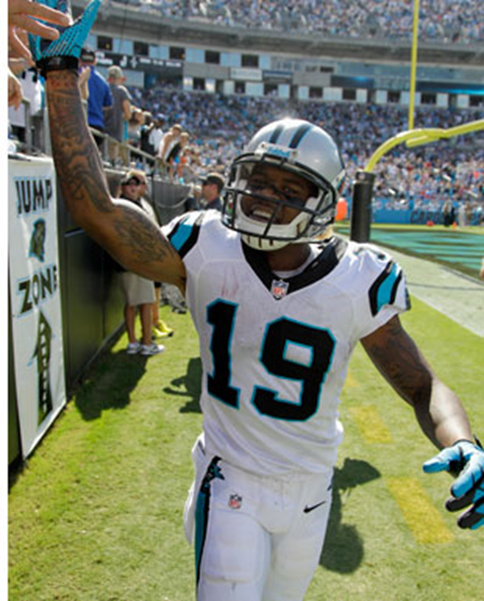 Being able to do that opens things up for everybody," Ginn said. "That's what it is about. You know your role. You know who you are." Ginn has always believed he was a capable NFL receiver. He has always felt he could help an offense succeed. He's getting a chance to prove it. "All he ever said was, 'Give me a chance,'" Rivera said. "And he just grabbed on. I think Ted sees something here that he likes. Hopefully, this is the beginning of something very good for him and for us."